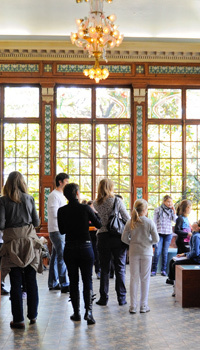 The guided tour enables visitors to discover the treasures of the Lumière museum. A guide accompanies visitors on a journey through the Lumière family history including the innovations that revolutionised aesthetics and the image industry: from the instantaneous photographic plates and the birth of the Cinematograph through to the first coloured photographs. Following the visit, enjoy the screening of the documentary entitled Le temps des Lumière that retraces the dazzling ascent of Antoine Lumière and his two sons, with numerous documents and testimonials from members of the family and specialists such as Bertrand Tavernier. Tariff : €3 (in addition to the entry fee to the museum) / recommended as of age 7 / duration: 1 hour. 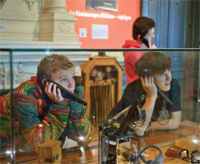 every day (except Mondays) at 3 p.m. during the school holidays and on Bank Holiday weekends. Audio guides available in French with an adult and children’s version (7/12). Also available in English, German, Italian and Spanish.